Although their campaign has concluded, if you would still like to make a donation to support YesPlus, you may always do so here. Help the YesPlus Meditation Club host a leadership and personal development workshop through yoga and meditation! YesPlus is an international wellness and leadership program organized in universities by student-led groups and powered by a non-profit educational organization called the International Association for Human Values (IAHV). IAHV's mission is to create a stress-free, violence-free society through personal development programs and humanitarian initiatives. YesPlus programs teach students to thrive in life and lead with clarity of mind, resilience, purpose, and belongingness. 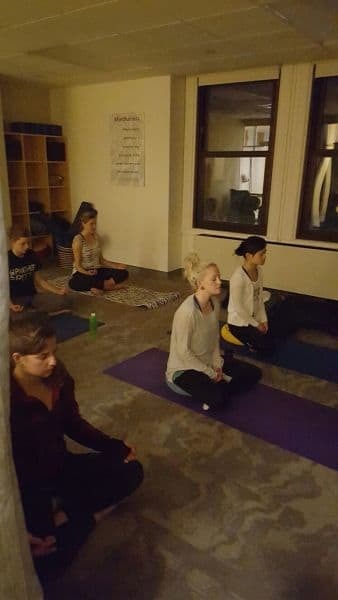 The Yesplus Meditation Club is a student-led organization whose mission is to provide students and the larger University of Pittsburgh community with tools, frameworks, and a community to build greater happiness and resilience, healthy lifestyles, positive relationships, and stronger purpose and confidence. We are working to bring a YesPlus Retreat to Pitt because it integrates well-being, personal resilience, and authentic connection with success and leadership. This innovative life-skills training program combines empirically-validated breathing and meditation practices with interactive discussions and experiential processes so students gain valuable skills to better navigate the personal, social, and academic landscape and pressures of college. The YesPlus Meditation Club at Pitt is planning to organize a YesPlus retreat for all students, staff, and faculty at University of Pittsburgh in October of 2017. Students learn unique life skills in a fun and light environment that integrates practical wisdom and leadership principles with practices that foster a relaxed mind, an energized body, clarity, focus, and personal responsibility. We are partnering with the International Association for Human Values (IAHV) to bring the YesPlus retreat program to Pitt. 2. New Perspectives - Frameworks for Happiness and Success: YesPlus offers simple universal principles to help students navigate relationships, opportunities, and challenges throughout their lives. 3. Positive Community: YesPlus builds positive communities rooted in belonging, naturalness, and trust. Students learn to build authentic trusting relationships, find strength in vulnerability, better handle criticism and mistakes, and value co-operation and conflict resolution. 4. Service & Leadership: YesPlus views service as a readiness to take responsibility to improve the world around us. The programs build skills to address campus needs, including soft skills in leadership and teamwork. An in-class service project cultivates a service mindset and helps shape students’ sense of fulfillment, purpose, and meaning. In order to bring this amazing event to Pitt's campus, we need your help! Anything raised above the amount needed to fund the workshop will be used to cover our general club expenses throughout the year. We believe YesPlus will impact the participants in these areas as well have a ripple-effect through the service module of the program. This will benefit the rest of the PITT/Pittsburgh community indirectly through the service initiatives taken up by the participants. A donation at this amount will pay for 1 day (of 5 total days) of training for one student. Thank you! A donation at this level will cover 1/2 of the full workshop cost for one student. Thank you! A donation at this level will cover the full cost for one student to attend the workshop. Thank you! A donation at this level will cover the full cost for two students to attend the workshop, or refreshment expenses for two days. Thank you! A donation at this amount will cover the costs for all clearances, food, and miscellaneous expenses for the workshop. Thank you for your support!